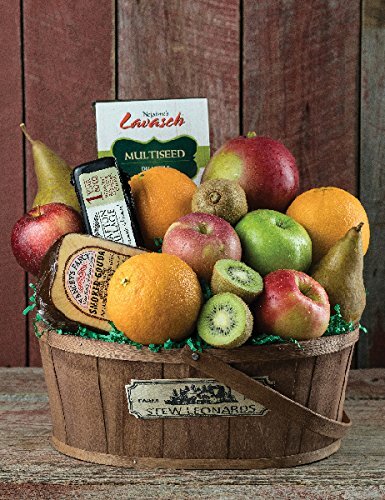 Our popular farm fresh fruit baskets get even better when we add our favorite specialty cheeses and top-notch multi-seed flatbread crackers. A terrific gift option for just about anyone. Includes Honeycrisp, Gala,Granny Smith and Fuji Apples, Kiwi, Mango, Oranges, Bosc Pears, Smoked Gouda, Vermont Cheddar Cheese and Multi Seed Flatbread Crackers. Delicious variety of fruit and cheeses! Perfect gift for any occasion!